Scotland's has a history that has often been turbulent. Bloodshed and war, arising from political, religious or national differences, continued sporadically for many centuries; and if that wasn't enough, large numbers of the poorest in rural societies were later cleared	off their ancestral lands, often by force, in the interests of "agricultural improvement". This history does much to explain why Scots have always been one of the most outward-looking and widely-travelled of races, reaching and creating new lives for themselves in just about every corner of the globe. We've seen it said that overall there are probably around five times as many Scots living outside Scotland than within it. As diasporas go, Scotland's is one of the most far flung and largest scale. Many of those who left Scotland to make new lives elsewhere achieved great things as explorers, as solders, as politicians, as inventors and more. But it is perhaps inevitable that, by the law of averages, some of those who left these shores made their names for altogether less positive reasons. 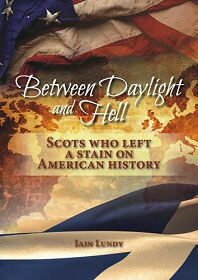 "Between Daylight and Hell: Scots Who Left a Stain on American History" by Iain Lundy is a well written and beautifully researched book that explores the lives of seventeen Scots who settled in America and whose deeds earned them infamy rather than fame. So it is that a gravestone in a cemetery in Illinois carries the inscription: "Daniel Stott. Died June 12, 1881. Aged 61 Years. Poisoned By His Wife & Dr Cream". Neil Cream was born in Glasgow before his family emigrated to Canada. He went on to study medicine before, for reasons that remain unclear, beginning a life that was to lead to serial murder on both sides of the Atlantic. He was eventually caught and executed in London, for poisoning prostitutes. But it's not just murderers. David Jack from Perthshire	achieved infamy by stealing land from settlers in California; Charles Forbes defrauded World War One veterans of millions of dollars; and Adam Stephen led troops into a Revolutionary War battle while drunk. What's	particularly nice is that the stories told between the covers of this book are the stories of those who are often overlooked by more conventional, more positive, histories. The book's cover reports that "everyone loves a good 'baddie' and this book is full of them." It is, and their stories are fascinating.